Hospital strategic planning is important in even the most stable of times. In these days of uncertainty, it is critical for every organization that wants to remain viable to prioritize strategic planning. In Part One of this White Paper Series, we tackled the issue of how to effectively complete strategic planning for a medical practice. 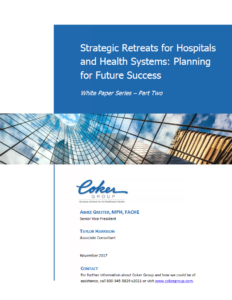 In this second part, we address how hospitals and/or health systems should approach strategic planning. Specifically, we will discuss how hospital administration should engage their physicians to develop a comprehensive strategic plan that meets the needs of all constituents, beginning and ending with the patient. While hospitals may be more prepared to weather the sweeping changes prevalent in the healthcare industry at this time due to their size and scope, they still need to be actively considering how to structure themselves, respond to the concerns of their employees, and address competitive forces. This whitepaper outlines the primary benefits of hosting strategic planning sessions and the results you can expect, both for your organization and your employees.